A small object distinguishable by children. To attain whole body training through the searching movements of children. Parents first hide an object in an easily searchable place (beware of danger in kitchen, toilet or other places at home). Allow the children to search freely at home so as to find the object out. When necessary, help the children perform movements for searching, such as squatting and climbing. 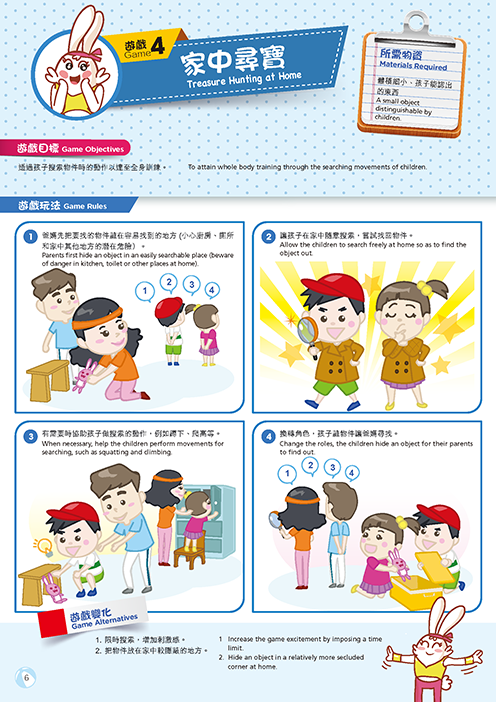 Change the roles, the children hide an object for their parents to find out. Increase the game excitement by imposing a time limit. Hide an object in a relatively more secluded corner at home.